The British Antarctic Survey (BAS) is the United Kingdom's national Antarctic operation. It is part of the Natural Environment Research Council. With over 400 staff, BAS takes an active role in Antarctic affairs, operating five research stations, two ships and five aircraft in both polar regions, as well as addressing key global and regional issues. This involves joint research projects with over 40 UK universities and more than 120 national and international collaborations. Having taken shape from activities during World War II, it was known as the Falkland Islands Dependencies Survey until 1962. Operation Tabarin was a small British expedition in 1943 to establish permanently occupied bases in the Antarctic. It was a joint undertaking by the Admiralty and the Colonial Office. At the end of the war it was renamed the Falkland Islands Dependencies Survey (FIDS) and full control passed to the Colonial Office. At this time there were four stations, three occupied and one unoccupied. By the time FIDS was renamed the British Antarctic Survey in 1962, 19 stations and three refuges had been established. In 2012 the parent body, NERC, proposed merging the BAS with another NERC institute, National Oceanography Centre in Southampton. This proved controversial, and after the House of Commons Science and Technology Committee opposed the move the plan was dropped. Of these Research Stations, only Rothera and Halley are usually manned throughout the year. Halley VI was closed for the March 2017 winter after relocation due to safety concerns when a previously inactive crack, "Chasm 1", in the Brunt Ice shelf began to expand in the direction of the base. The base was closed again in March 2018 with similar concerns. The remaining bases are manned only during the Antarctic summer. Both South Georgia bases are manned throughout the year. The headquarters of the BAS are in the university city of Cambridge, on Madingley Road. This facility provides offices, laboratories and workshops to support the scientific and logistic activities in the Antarctic. The BAS also operates the Ny-Ålesund Research Station on behalf of the NERC. This is an Arctic research base located at Ny-Ålesund on the Norwegian island of Spitsbergen. BAS operates two ships in support of its Antarctic research programme. Whilst both vessels have research and supply capabilities, the RRS James Clark Ross is primarily an oceanographic research ship, whilst RRS Ernest Shackleton is primarily a logistics ship used for the resupply of scientific stations. James Clark Ross replaced RRS John Biscoe in 1991 and Ernest Shackleton was the successor to RRS Bransfield in 1999. Both vessels depart from the United Kingdom in September or October of each year, and return to the United Kingdom in the following May or June. Both vessels undergo refit and drydock during the Antarctic winter, but are also used elsewhere during this period. James Clark Ross often undertakes scientific research on behalf of other organisations in the Arctic, whilst Ernest Shackleton is chartered into commercial survey work. The two civilian ships operated by the BAS are complemented by the capabilities of the Royal Navy's ice patrol vessel that operates in the same waters. Until 2008 this was HMS Endurance, a Class 1A1 icebreaker. Endurance's two Lynx helicopters enabled BAS staff to get to remote field sites that BAS aircraft could not access. However, a catastrophic flooding accident left Endurance badly damaged, with a replacement only being procured in 2011. 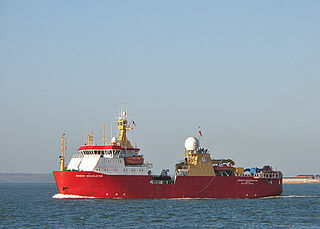 This ship, HMS Protector, first deployed to the Antarctic in November 2011. In April 2014 the government authorised the procurement by BAS of a new large Antarctic research vessel at an estimated cost of £200 million, expected to be in service in 2019. The BAS Dash-7 at Port Stanley Airport on the Falkland Islands. BAS operates five aircraft in support of its research programme in Antarctica. The aircraft used are all made by de Havilland Canada and comprise four Twin Otters and one Dash 7. The planes are maintained by Rocky Mountain Aircraft in Springbank, Alberta, Canada. During the Antarctic summer the aircraft are based at the Rothera base, which has a 900-metre gravel runway. During the Antarctic winter, conditions preclude flying and the aircraft return to Canada. The larger Dash 7 undertakes regular shuttle flights between either Port Stanley Airport on the Falkland Islands, or Punta Arenas in Chile, and Rothera. It also operates to and from the ice runway at the Sky Blu base. The smaller Twin Otters are equipped with skis for landing on snow and ice in remote areas, and operate out of the bases at Rothera, Fossil Bluff, Halley and Sky Blu. RRS Ernest Shackleton outward bound from Portsmouth, UK, 12 November 2008. In January 2008, a team of British Antarctic Survey scientists, led by Hugh Corr and David Vaughan, reported that 2,200 years ago, a volcano erupted under Antarctica's ice sheet (based on airborne survey with radar images). The biggest eruption in the last 10,000 years, the volcanic ash was found deposited on the ice surface under the Hudson Mountains, close to Pine Island Glacier. The British Antarctic Survey were also responsible for the discovery of the hole in the ozone layer over Antarctica. The discovery was made in 1985 by a team of three BAS scientists: Joe Farman, Brian Gardiner and Jonathan Shanklin. Their work was confirmed by satellite data, and was met with worldwide concern. The BAS runs an online polar image collection which includes imagery of scientific research at the poles, logistics operations, and the continent and its wildlife. The image collection is run by British cameraman and photographer Pete Bucktrout, who has visited the continent eleven times during his 24 years working for BAS. His work has been seen in newspapers and on television around the world. ^ "Business Plan 2011" (PDF). British Antarctic Survey. Retrieved 3 September 2012. ^ "BAS Vision and Mission". British Antarctic Survey. Retrieved 24 September 2017. ^ "British Research Stations and Refuges – History". British Antarctic Survey. Retrieved 11 November 2007. ^ McKie, Robin (29 September 2012). "Antarctic research at risk as government cuts back on science". The Observer. Retrieved 4 November 2012. ^ "Think again on British Antarctic Survey merger say Science and Technology Committee". UK Parliament Website. 31 October 2012. Retrieved 4 November 2012. ^ Carrington, Damian; McKie, Robin (4 November 2012). "Research boss Wingham in trouble over British Antarctic Survey claim". The Observer. Retrieved 4 November 2012. ^ Roberts, Brian (January 1974). "New director of the British Antarctic Survey: Dr R.M. Laws". Polar Record. 17 (106): 49. doi:10.1017/S0032247400031375. Retrieved 4 November 2012. ^ "Laws Prize 2012". British Antarctic Survey Club. Archived from the original on 9 October 2012. Retrieved 4 November 2012. ^ "Professor David J Drewry". Anglia Ruskin University. Retrieved 4 November 2012. ^ Randerson, James (31 August 2007). "Profile: Chris Rapley". The Guardian. Retrieved 4 November 2012. ^ "New Director for the British Antarctic Survey". British Antarctic Survey. Retrieved 4 November 2012. ^ "NOC welcomes Nick Owens appointment as SAHFOS Director". National Oceanography Centre. 10 May 2012. Retrieved 4 November 2012. ^ a b "British Antarctic Survey has a new director: climate expert Professor Jane Francis". Merco Press. 2013. Archived from the original on 23 October 2014. Retrieved 23 October 2014. ^ "The BAS Executive Team". bas.ac.uk. ^ "BAS PSPE Organisation 28 November 2012" (PDF). 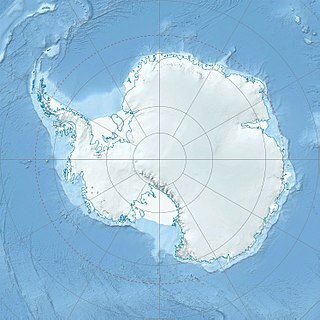 antarctica.ac.uk. ^ Blake, David (September 2005). "Extreme Engineering". Ingenia (24). Retrieved 28 March 2010. ^ Patrick Sawer (5 December 2015). "The ice station that needs saving from the abyss". The Telegraph. Retrieved 11 November 2018. ^ "Halley Research Station will not winter in 2018". BAS. 31 October 2017. Retrieved 11 November 2018. ^ "Halley Research Station Antarctica to close for winter". BAS. 16 January 2017. Retrieved 11 November 2018. ^ a b "Research Stations in Antarctica". British Antarctic Survey. Retrieved 31 December 2007. ^ "BAS Cambridge". British Antarctic Survey. Retrieved 31 December 2007. ^ "Ny-Ålesund Arctic Research Station". British Antarctic Survey. Archived from the original on 23 December 2007. Retrieved 2 January 2008. ^ a b "Research Ships". British Antarctic Survey. Archived from the original on 14 December 2007. Retrieved 31 December 2007. ^ "RRS Bransfield – History". British Antarctic Survey. Retrieved 28 March 2010. ^ "HMS Endurance – Ice Patrol Vessel". British Antarctic Survey. Archived from the original on 7 June 2011. Retrieved 31 December 2007. ^ "Protector sails on her debut voyage to the ice". Royal Navy. Archived from the original on 2 December 2011. Retrieved 1 December 2011. ^ "£200 million floating laboratory will explore 'final frontier' of polar regions". The Telegraph. 25 April 2014. Retrieved 30 April 2014. ^ a b "Aircraft in Antarctica". British Antarctic Survey. Archived from the original on 29 January 2008. Retrieved 31 December 2007. ^ Black, Richard (20 January 2008). "Ancient Antarctic eruption noted". BBC News. Retrieved 28 March 2010. ^ "The Ozone Layer". British Antarctic Survey. 18 May 2015. Retrieved 30 November 2015. Wikimedia Commons has media related to British Antarctic Survey. Signy Island is a small subantarctic island in the South Orkney Islands of Antarctica. It was named by the Norwegian whaler Petter Sørlle after his wife Signy Therese. The British Antarctic Territory (BAT) is a sector of Antarctica claimed by the United Kingdom as one of its 14 British Overseas Territories, of which it is by far the largest by area. It comprises the region south of 60°S latitude and between longitudes 20°W and 80°W, forming a wedge shape that extends to the South Pole, overlapping the Antarctic claims of Argentina and Chile. Halley Research Station is a research facility in Antarctica on the Brunt Ice Shelf operated by the British Antarctic Survey (BAS). The base was established in 1956 to study the Earth's atmosphere. Measurements from Halley led to the discovery of the ozone hole in 1985. The current base is the sixth in a line of designs to overcome the challenges of building on a floating ice shelf where they become buried and crushed by snow. Despite moving the buildings 23km "inland", concern over the propagation of an ice crack resulted in the base being left unmanned for the winters of 2017 and 2018 and will be left unmanned for the winter of 2019. The Rothera Research Station is a British Antarctic Survey (BAS) base on the Antarctic Peninsula, located at Rothera Point, Adelaide Island. Rothera also serves as the capital of the British Antarctic Territory, a British Overseas Territory. Signy Research Station is an Antarctic research base on Signy Island, run by the British Antarctic Survey. Fossil Bluff is a seasonal British aircraft refuelling station located on the northwest coast of Antarctica. In operation since 1961, its facilities provide fuel, storage, and ancillary support for British exploration and operations during the summer season, October through March. The site is adjacent to a natural, north-south travelling route along the George VI Ice Shelf. Sky Blu is a forward operating station for the British Antarctic Survey located in southern Palmer Land, Antarctica. It is in an area of blue ice, an extremely hard and dense ice which has lost the air bubbles that normally cloud the ice. It provides a runway able to accommodate wheeled aircraft that are larger than can be handled by other types of runways in the area. The Teniente Luis Carvajal Villaroel Antarctic Base is a non-permanent seasonal Chilean Antarctic base located on the south-west tip of Adelaide Island, in Graham Land off the west coast of the Antarctic Peninsula in the Chilean region of Magallanes. RRS Ernest Shackleton is a Royal Research Ship operated by the British Antarctic Survey. She is primarily a logistics ship used for the resupply of scientific stations in the Antarctic. The British Antarctic Territory (BAT) is a sector of Antarctica claimed by the United Kingdom as one of its 14 British Overseas Territories. It comprises the region south of 60°S latitude and between longitudes 20°W and 80°W, forming a wedge shape that extends to the South Pole. The Territory was formed on 3 March 1962, although the UK's claim to this portion of the Antarctic dates back to Letters Patent of 1908 and 1917. The area now covered by the Territory includes three regions which, before 1962, were administered by the British as separate dependencies of the Falkland Islands: Graham Land, the South Orkney Islands, and the South Shetland Islands. RRS Bransfield was an ice-strengthened cargo vessel, purpose-built for the British Antarctic Survey (BAS). Turner Glacier is a glacier on the east side of Mount Liotard flowing northeast into Ryder Bay, Adelaide Island. The glacier was surveyed by Falkland Islands Dependencies Survey (FIDS), 1948, and photographed from the air by Falkland Islands and Dependencies Aerial Survey Expedition (FIDASE), 1956-57. Named by the United Kingdom Antarctic Place-Names Committee (UK-APC) in 1977 after Andrew John Turner, British Antarctic Survey (BAS) builder, Halley Station, 1973–74; Signy Island, 1974–75; Rothera Station, 1976–77, 1978–80; and Faraday Station, 1982-83. 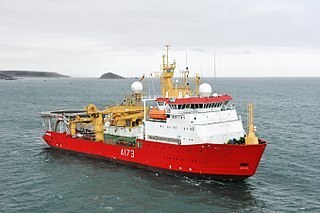 HMS Protector is a Royal Navy ice patrol ship built in Norway in 2001. As MV Polarbjørn she operated under charter as a polar research icebreaker and a subsea support vessel. In 2011, she was chartered as a temporary replacement for the ice patrol ship HMS Endurance and was purchased outright by the British Ministry of Defence in September 2013. RRS Sir David Attenborough is a research vessel owned by the Natural Environment Research Council, to be operated by the British Antarctic Survey for the purposes of both research and logistic support. In this, the ship is intended to replace a pair of existing vessels, RRS James Clark Ross and RRS Ernest Shackleton. The vessel is named after famed broadcaster and naturalist Sir David Attenborough, and is currently being fitted out. Rothera Research Station is the BAS logistics centre for the Antarctic and home of well-equipped biological laboratories and facilities for a wide range of research. The station is situated on a rock and raised beach promontory at the southern extremity of Wormald Ice Piedmont, south-eastern Adelaide Island.